You’ve probably seen cool lava rock furniture or accessories around before and it’s not hard to see why they are so popular as they really add an element of interest into your home decor. These formations are from igneous rocks that form from erupting Earth magma (lava) by cooling and hardening. These wonders of nature can be turned into delightful pieces as well. Lava rocks have a really rich texture that doesn’t need much design as it looks good enough on its own. You can go minimalist with this style and these lava plates have contrasting textures of smooth and rough which can be used for just about anything. Crafting a quirky shelf out of volcanic rock is pretty awesome too, as proven by this interesting piece that will look good in any home. You can slip it in any nook or cranny you have at home so that it makes a nice little storage space for you. It’s pretty common for basins and sinks to be made out of lava rock as they are durable and look good even with everyday use. The interior of this sink is smooth while the outside is rough, which means you have a great contrast between textures for a stylish bathroom. Coffee tables are important to spice up your living room and provide storage space to place some decorative items or food and beverages when entertaining guests. This modern and sleek coffee table made out of lava rock with a rose gold accent can jazz up your living room. You might be thinking that volcanic rock is only suitable for rough designs but this dining table will prove you wrong. 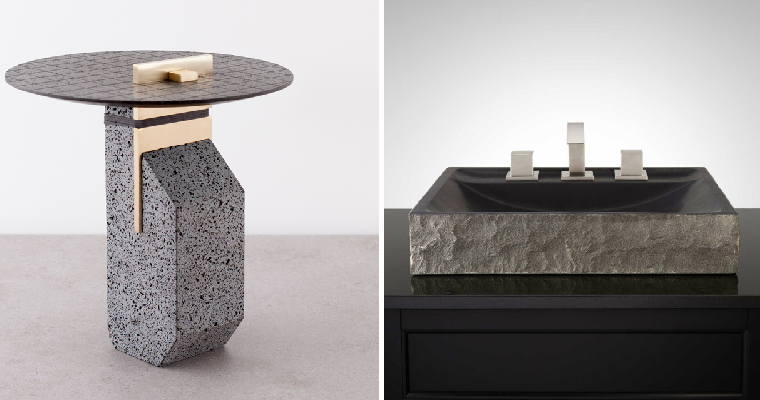 Made out of the same lava rock that will add instant charm to any home, this table is refined elegance and thanks to its minimalistic design, is super versatile as well.